Gibson master luthier Ren Ferguson recently visited one of the hottest Gibson Five Star Dealers in the U.S., Bailey Brothers Music in Birmingham, Ala., to unveil three new historic models exclusive to our Five Star Dealers. Owner Clay Bailey and Gibson Acoustic Certified Specialist Keith Edwards set the stage with a beautiful display of Gibson Acoustic models for Ferguson to bring to life with stories of their history, unique qualities, famous owners, platinum records and living-room rock stars. Ferguson shared his own stories as well, including how he came to make some of the finest acoustic guitars in the industry and arguably the best acoustic guitars Gibson has ever produced. Perhaps the most moving moment came later though, when Ferguson returned to the shop in Montana. A letter arrived from a fellow who had driven over two hours to be in the audience at Baileys. 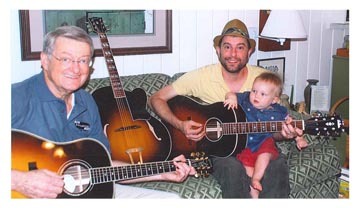 Included in the note were two photos, one of his grandson, Gibson (no kidding), with his Papa's 1949 ES – 125 and one with three generations of Gibson Acoustic fans: father, son and grandson each with their favorite Gibson Acoustic. The letter was passed around the office soliciting "oooh's" over both Gibsons in the picture. Thanks to all the staff at Bailey Brothers Music who helped to put on a great event with Gibson friends and thanks to all who attended and shared their stories with us. Bailey Brothers has been providing quality musical instruments and educational opportunities to the Birmingham area for over 25 years. 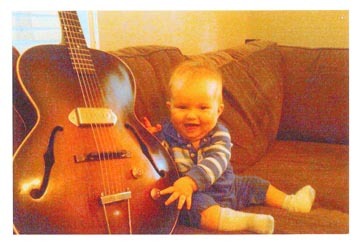 Little Gibson & his Papa's 1949 Gibson ES-125. Robert Sr., Robert Jr. & Gibson with their favorite Gibson guitars, an AJ, LC-7 and a new J-45 purchased from Bailey Brothers in Birmingham. Keith Edwards, Ren Ferguson and Clay Bailey, Bailey Brothers Music, Birmingham, Ala.
Ren Ferguson shares talks about recreating historic 1930s model Gibson Acoustic guitars. Everyone wanted to test drive a new Gibson Acoustic and say they jammed with Ferguson. Many who own Gibson Acoustic guitars consider them to be more than an instrument they possess. Owning a Gibson imparts a certain pride and affection. At Gibson Acoustic we have the same pride and affection for our customers as they do in their guitars, considering them old friends. We look forward to the reunion that is the Gibson Homecoming as an opportunity to reconnect, share stories, songs and successes. The sixth annual Gibson Homecoming, organized by Gibson’s longtime friend Mike Goecke, was another successful reunion. Folks came from all over the United States and Canada. Those that made the trek to Bozeman, Montana, were treated to a personal tour of the Gibson Acoustic facility, a day-long celebration event at the local Five Star Gibson Acoustic Dealer, Music Villa, open mic and jam events and lots of camaraderie. 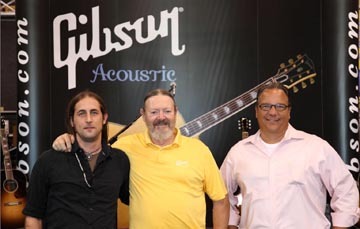 Guests spent the afternoon with Gibson Acoustic General Manager Dennis O’Brien, Master Luthier Ren Ferguson and Product Specialist Jeremy Morton getting the inside skinny on new materials, maintaining instruments and what’s new. With Yellowstone National Park around the corner, the lure of a day trip couldn’t be resisted as well as the opportunity to tour other local music manufacturers, Weber Mandolins and Waverly Manufacturing. Music Villa hosted special performances by local artists Little Jane and the Pistol Whips, Jeremy Morton (our rock-star Product Specialist) and Mike Beck. Their Gibson Acoustic Certified Specialists offered free string changes and setups for Gibson guitars and many door prizes were given away. Lucky winners came away with a Gibson barstool, Epiphone and Gibson electric guitars and the Grand Door Prize, a Gibson Hummingbird. Plans are already being made for the 2012 Gibson Homecoming, which will be held June 13-16, 2012. Inquiries and registration can be made by contacting Mike Goecke at guitarstrmr@aol.com or visiting the Gibson Homecoming website at http://www.gibson-homecoming.com/. Ask someone who owns a Nick Lucas special, if they imagined a guitar worth $20,000 today could have been purchased for $125 dollars new from the factory in the 1930s. Gibson Acoustic Guitars have proven to be a good investment over time, but none so much as those early limited-edition runs. The master luthiers at the Gibson facility are seeking to change that. Today’s equivalent of those special limited-edition runs is Gibson’s Five Star Dealer exclusive custom models. In order to help support our valued Five Star Dealer network as well as offer the guitar connoisseur a choice in collectable instruments, the Gibson development team builds a series of unique models each year that are only available to our Five Star network of dealers. The exclusive Five Star Dealer guitars offered in 2011 are a master collection of pieces that cover the gamut from early classics to modern interpretations of Gibson icons, each with unique qualities designed to be assets in the collectible market. For the historic 1930s series, Gibson Master Luthier Ren Ferguson set out to build the most authentic limited-edition reissues from Gibson’s early classic period: the J-35, L-00 and L-1 models. Each of these master works is hand crafted from a Red Spruce top in order to reproduce the vintage tone of the original 1930s models. The top braces are precision cut to match the originals, hand fit to the top by Ferguson using historic bracing patterns and techniques then set with Gibson’s custom hide glue in his personal workshop. The L-1’s back and back bracing is finished by Ferguson in the same fashion. After the tops for each guitar leave Ferguson’s workshop, the back and sides on the L-00 and J-35 are fashioned from Mahogany by the master craftsmen in Bozeman. Each guitar dons a customary bone nut and saddle. The J-35 is finished in an antique natural lacquer, while the L-00 and L-1 bear the traditional ‘30s dark burst lacquer. And, for the first time since Gibson Acoustics have been made in Montana, all three include a period-correct silk-screened peg head logo. These models, as with their counterparts from the last century, are exceptionally responsive due to their lightweight and traditional construction. They are crafted from the same woods, have slim, tall braces and traditional finishes which provides the perfect foundation for an instrument’s personality to mature and blossom. We expect these guitars to exceed the connoisseur’s expectations in tone, performance and value. The Historic Luthier’s Choice run is available only to Five Star Dealers in the United States. In this year’s second offering, Ferguson and his team are highlighting the 60th Anniversary of the J-185 and the 75th Anniversary of the Advanced Jumbo. This anniversary run will be available to Five Star Dealers worldwide. The J-185 model, one of Gibson’s best kept and highly coveted secrets, was originally released in 1951. A relatively rare model, Ferguson celebrates this classic flat-top with a 60 -piece run. The anniversary model’s Adirondack Red Spruce top, Quilted Maple back and sides, and traditional bracing pattern give this guitar a bold and powerful voice. This model is available in an antique natural or vintage sunburst finish. With only 60 guitars being produced, the J-185 60th Anniversary is certain to be as desirable to collectors as the originals. When Gibson designed the Advanced Jumbo in 1935, they set out “to produce the best-sounding, most powerful flat-top to date.” The 75th Anniversary Advanced Jumbo lives up to its ancestor’s reputation as the standard by which every other flat-top is judged. The 75th Anniversary AJ features a premium Bavarian Spruce Top, considered one of the finest soundboard material woods ever used for instruments. The guitar’s back and sides are crafted from Indian tonewood, handpicked by Ferguson for its exceptional reflective nature and superior resonance. Finished in a brand new “Montana Sunset” bursted-top, the guitar enjoys ebony-bound fingerboard and bridge, a Baggs Element pickup system, solid bone nut, saddle, and bridge pins for maximum tonal power, and an engraved 75th Anniversary truss rod cover. Only 75 guitars will be produced in this model. Any connoisseur of rare special-run guitars knows how instruments such as these grow in value. For example, a 1930s AJ in good condition will Blue Book around $60,000. Other Master Works by Ren Ferguson have been known to command as much as $100,000. Gibson is proud to have a network of dealer partners who recognize and appreciate the unique offering of these collectable instruments. With a select few Five Star Dealers worldwide and an even fewer number of guitars built with this level of hand craftsmanship, we look forward to seeing these guitars grow not only as exceptional players, but also as investments. As a product specialist for the Gibson Acoustic division, I get the opportunity to travel and see a lot of our great country. March offered me the chance to expand my horizons, as Yorkville Distributing extended the invitation to travel throughout Western Canada, visiting retail stores to do both staff training and public events. Day One took me to Calgary, where I met up with Yorkville’s Jeremy Berger. 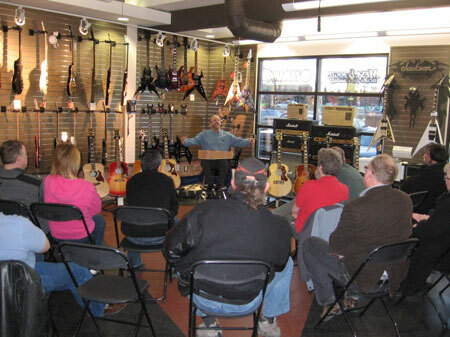 We then proceeded to Long and McQuade for staff product training. Later, it was off to Guitarworks, where I did a public presentation on the history and architecture of the Montana acoustics. The attendees all displayed a passion for guitars, and many had brought their vintage instruments along for a little show-and-tell. Guitarworks also had the Limited Edition 50th Anniversary Hummingbirds which, although sold, they allowed the customers to admire. The following day’s travels took us to Edmonton, Nanaimo, Victoria, and Vancouver with store visits, staff training, and public events filling our days. With Western Canada sales rep Owen Connell as our guide, we had the chance to see some beautiful country, spend time in some incredible acoustic rooms, work with knowledgable sales staffs, and meet many Gibson fans, both young and old. All appreciated the craftsmanship and history that is Gibson, and I came home knowing that the desire to own a true hand-crafted instrument is alive and well. 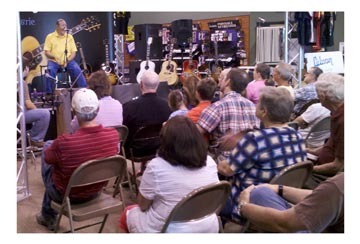 Earl Teat Music in Dover, Delaware, was host to Gibson Day on August 24th. The Montana Acoustic and Custom Shop trailers were on hand so folks from as far away as New York could play guitars, visit with Gibson representatives, and sing up for chances to win prizes. 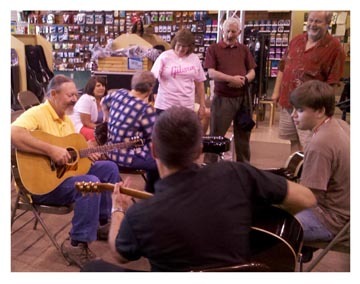 Owner Dale Teat and his staff were busy all day helping customers interested in the Gibson guitars, and fans both old and new were treated with the chance to play various Acoustic and Electric instruments that they might not normally get to see. Several lucky customers even took the opportunity to take home a new Gibson. Aaron Taylor is shown here, along with Gibson Montana representative Don Ruffatto, proudly holding his new Super Dove. Gibson Guitars would like to thank the ownership and staff of Earl Teat Music for their hospitality. "I went to the Green Day concert on August 3rd 2010 in Camden NJ. This was the first show of their American tour. As always, the band played an incredible set. Once they were done Billie Joe came out for an acoustic encore. He played "When It's Time," "Wake Me Up When September Ends," (for which the whole band came out on stage again), and lastly "Good Riddance (Time of Your Life)." After that final song, Billie Joe started to take off his guitar strap and it seemed like he was planning to give away the guitar. He walked over right in front of me, pointed at me, and said that the guitar was mine. Security told me to climb over the barricade and get on stage. They handed me the guitar and ran me straight backstage to a VIP room. I've absolutely idolized this band since 1994 when I first heard them, so this moment was just incredible for me. It was great to see once again how much the band truly appreciates their fans." 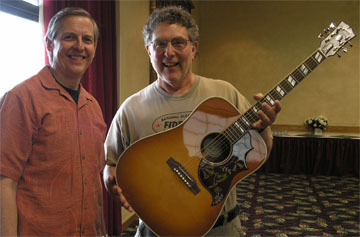 August 7th brought Gibson Acoustic Day to Music Villa in Bozeman, Montana. With the annual Sweet Pea Music and Arts festival taking place just up the street, many people, both old customers and festival attendees, had the chance to stop by and visit with factory representatives and try out the many Gibson Acoustics that the store has in stock. Along with the wonderful guitars displayed, Gibson owners were treated to re-stringing and set ups. Serious customers and just the curious were able to ask questions, play guitars, and get in on the giveaways that were drawn for throughout the day. Adding to the festivities were performances by local and touring musicians, much to the delight of the crowds. Gibson’s own Sarah Moranville and Levi Main kicked off the day. They were followed by local singer/songwriter Ashley Holland. Headlining the event was independent recording artist Stephanie Quayle, with Los Angeles based guitar player and producer Asaf Rodeh. A Bozeman local, Stephanie is currently working on her fall tour, and her music can be found at www.stephaniequayle.com. Other activities rounded out the weekend, including the Music Villa Performance Academy’s own band “The Fire Marshalls” (featuring Gibson girl Caroline Janssen) performing at a fundraiser for the Bozeman Public Library. Gibson Montana would like to thank the staff at Music Villa, the performers, and all of the wonderful folks in attendance that helped make Gibson Acoustic Guitar Day a success. Lots of great things continue to happen here at Gibson Acoustic. This week we had the opportunity for Jackson Browne, David Lindley and the entire band to stop by the Montana factory. With Jackson and all being in town for a Tuesday (8/3) concert at the MSU Field House, the opportunity for a visit materialized and they were able to fit it into a very busy schedule. And what a great visit it was. All had the opportunity for an in-depth plant tour given by custom shop luthier Jason Jones. Jason led the way through the entire building process, and all were very excited by the tour and all of the great Gibson people and guitars. Jackson also spent key time with Robi Johns and Ren Ferguson, working on and refining the search for that special tone and sound for the future release of a very special model that will bear Jackson Browne’s name and endorsement. What a great experience this is to work with a talent like Jackson on what will truly be a guitar for the most refined acoustic player. .
All of the folks here at Gibson Montana were excited to have these great visitors and were all also very appreciated of the numerous, wonderful “shout outs” that Jackson, Davis and the band provided at their concert Tuesday night. And speaking of the concert, Jackson rocked the house and the crowd responded accordingly. It was a truly great concert and night out for anyone who attended. .
Gibson Acoustic had another great set of visitors to the Montana factory. On Tuesday 7/27, Riders In The Sky made a visit and were given the royal tour by master luthier Ren Ferguson. Afterwards, a number of prototype guitars were presented to Ranger Doug for review and discussion on the potential for a new guitar. Additionally a number of classic Gibsons were brought out and shared with all. A really great time and discussion. Summer once again brought a group of die-hard Gibson Acoustic fans to Bozeman, Montana. The 5th Annual Gibson Homecoming took place June 23-26, and all in attendance had a wonderful time. From factory tours of the Montana facility and other local music industry manufacturers, trips to Yellowstone Park, and nightly jam sessions, the activities kept the group busy from morning to night. Arriving from all parts of the US and Canada, these Gibson die-hards love the yearly gathering to share stories, swap guitars, and just absorb the atmosphere that is Montana at its best. A concert was held for the group at Music Villa, featuring store owner Paul Decker and the band Little Jane and the Pistol Whips. There were also nightly open mic sessions that kept the music rolling deep into the evening. As event coordinator Mike Goecke stated, “The Gibson Homecoming is an opportunity to see how much work actually goes into making a Gibson acoustic guitar, and to see how hard the people at Gibson work to make the best guitars in the world”. 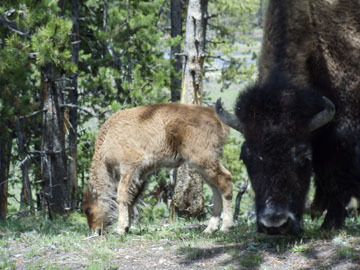 Planning is already under way for next year’s event, tentatively slated for June 15-18, 2011. Anyone interested in getting on the mailing list for updates can find information at www.gibson-homecoming.com.